Where you can learn all about Voodoo Highway or simply "Hide Out with the Blues"
We are very excited to announce the lineup for our Labor Day Weekend music festival, Rock and Roar at the Ross Park Amphitheater, presented by McDonald’s. It will be a day full of great music in a variety of genres. We have several new bands on the bill this year, including Binghamton University band Pool (2-time winners of the University’s Battle of the Bands), the great jam band Raibred, folk-rock favorites Next To Kin, and award-winning singer-songwriter Bess Greenberg. These groups will be joining returning musicians Woodshed Prophets, Devinne Meyers, and of course, Voodoo Highway. In addition, our new Grateful Dead tribute project, Voodoo Highway & Company will be making our debut at the festival. There will also be artists set up all around the festival and throughout the zoo. So if you’re within striking distance, mark your calendars and join us for a day of music, art, vendors, and great BBQ by Saucy Hog. We had some memorable shows in late winter/early spring, including a packed house at First Friday Owego at Original’s and a spectacularly well-attended jam at Ransom Steele Tavern in Apalachin, as well as an acoustic show on the courthouse steps in Binghamton for the Tax Day Rally. We are gearing up for more, including a jam and a show on the road in Sandusky, Ohio, and are in full planning mode for our summer festivals: Marathon Music Fest (5/28) and Rock and Roar (9/3). Stay tuned for more details! We are also in the midst of a big project that we are very excited about–more details on that coming soon as well. In the meantime, catch us at one of our shows if you can, and keep on rockin’! 2016 was a banner year for us in many ways, with so many shows at so many venues, several festivals, a whole bunch of jams with so many talented people, and some especially memorable shows with several world-class musicians who we brought over from Italy. 2017 is shaping up to be equally exciting! Please Like us on FB and check our Tour Dates page regularly for upcoming shows! Italian rock violinist Andrea Di Cesare came back to Binghamton, this time accompanied by guitarist/singer-songwriter Pier Cortese (also from Rome). They both played several shows with Voodoo Highway; scroll down for details or check out the FB Event Page. A highlight was a last-minute addition to the schedule which had Andrea playing the National Anthem at the Owego Veterans Day celebration. Other highlights included–well, just about every show we played with them while they were here! Till next time, Andrea and Pier! Wednesday, Nov. 2, 7pm: Radio interview on WHRW FM’s The Signal with Chris Kocher. The second festival we organized this summer, the Rock and Roar Music Festival, was held at the fabulous new amphitheater at the Ross Park Zoo, on Sunday of Labor Day weekend (9/4). It featured a full day of music, about a dozen local artists/painters, plus food vendors and more. For details, check out the Rock and Roar Festival on Facebook, and for pics, check out the album on FB. Can’t wait for next year! Marathon Music Fest was a blast! The first of two music festivals we are organizing this season took place in Binghamton on Sunday of Memorial Day weekend and featured over two dozen acts in over a dozen venues along the route of the Herald of Victory Marathon and Ride for Life 26.2 Bicycle Tour, as well as one heck of a party at the finish line (with a microbrewery festival and live music all day). It was so much fun to rock our city alongside so many of our region’s great musicians. And we got awesome feedback from the runners and cyclists who said that despite the fairly brutal high temperatures, this was one of their favorite marathons ever! We are thrilled to have been a part of their great experience. Here’s just one pic, but for about 100 more check out the photo album on Facebook. 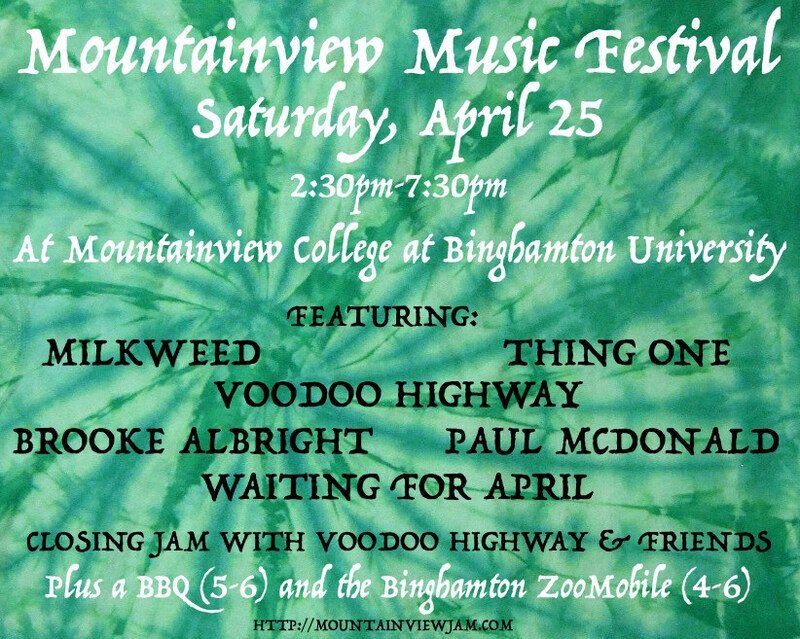 We are happy to announce the awesome lineup for the music festival we’ve organized and that will be taking place this Saturday on the Binghamton University campus. If you’re within striking distance, join us Saturday from 2:30-7:30 on the main field at Mountainview College, up the hill on campus. Red's Kettle Inn--Open Jam with Voodoo Highway May 9, 2019 at 7:00 pm – 10:00 pm Reds Kettle Inn, 93 C F J Blvd, Johnson City, NY 13790, United States Join us for our monthly hosting of one of the area's longest running and best jams! Open jam/ mic. All levels welcome. Please bring your own instruments. Perform by yourself, with a specific group of people, or with the band/regular jammers--your choice!